The first hard disk drive, like so many innovations in computing, came from IBM. 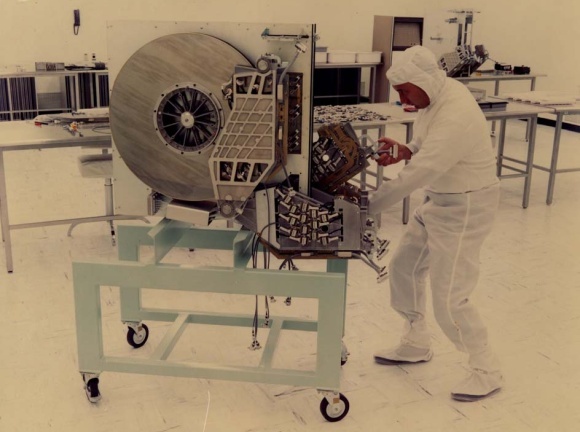 It was called the IBM Model 350 Disk File and was a huge device. It had 50 24-inch disks contained inside a cabinet that was as large as a cupboard and anything but lightweight. This hulk of a storage unit could store a whopping 5 MB of data. 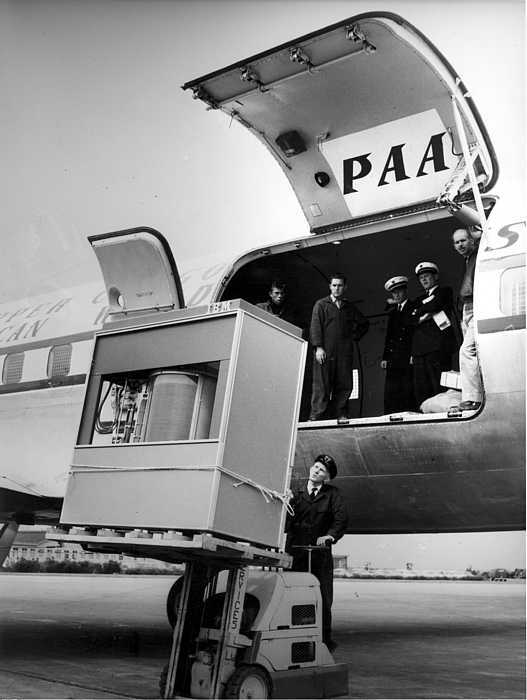 Above: An IBM Model 350 Disk File being delivered. Yes, that’s ONE hard disk drive unit. Although hard disk drives kept improving, state-of-the art disks were built according to the concept “bigger is better” well into the ‘80s. Hard disk drives were normally used together with big mainframe computers, so this was not such a big deal. Entire rooms were already set aside for the computers. Case in point, here below is a 250 MB hard disk drive from 1979. Above: State-of-the-art hard disk drive from the ‘70s. 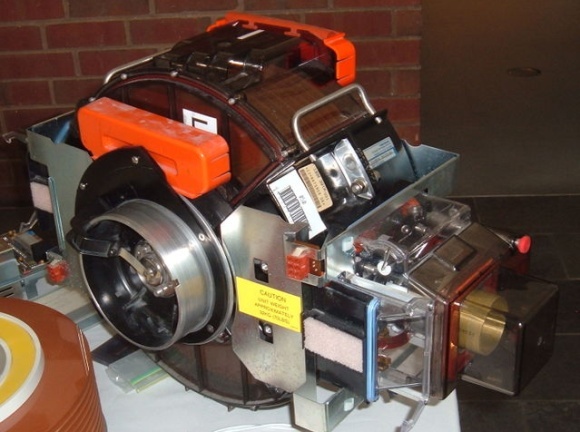 IBM introduced the first hard disk drive to break the 1 GB barrier in 1980. It was called the IBM 3380 and could store 2.52 GB (500 times more than the consumer options at the time). Its cabinet was about the size of a refrigerator and the whole thing weighed in at 550 pounds (250 kg). Above: The disk drive module of the IBM 3380. Early in the ‘80s, smaller “consumer” hard disk drives designed to be used with the increasingly popular microcomputers (now known as PCs) started to appear. The first ones were 5 MB in size and had a form factor of 5.25 inches. For a visual on how hard disk drive sizes have changed since the ‘80s until today, have a look at the below image with an old 8-inch drive all the way down to today’s 3.5-inch, 2.5-inch and 1.8-inch drives. Above: Three decades of shrinkage. The first hard disk drive back in 1956 could store 5 MB of data, which was a huge amount at the time. This is coincidentally also the size of the first “small” 5.25-inch hard disk drive that arrived in 1980. We went from having to have a special room for the hard disk drive and its computer, to having one we could put inside a desktop computer. Ten years later, in 1990, a normal hard drive held about 40 MB, with more expensive options able to store more than 100 MB. Fast forward to present day, and you can buy a 3.5-inch hard disk drive with 2 TB of storage space. 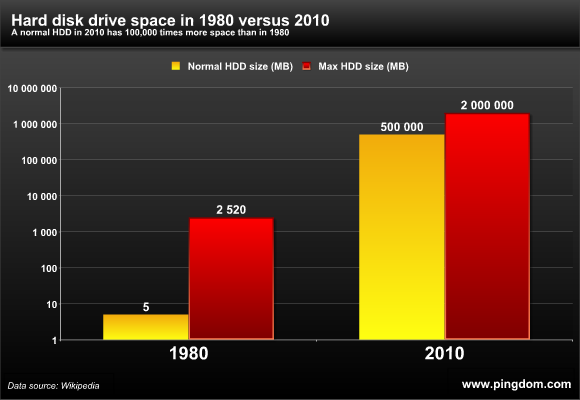 To illustrate the tremendous increase in storage space that we have seen in the last 30 years (essentially since the birth of personal computing), we have made a 1980 vs. 2010 side-by-side comparison chart here below. Note that we have used a logarithmic scale in this chart. Each step on the Y axis is 10 times larger than the one below it. If we had used a regular, linear scale, the columns for 1980 would have been less than a pixel high. As you can see, the gap between a normal versus a top-of-the line hard disk drive in terms of storage space has become much, much smaller than in the past. And as an added bonus, they also have the same physical size these days, which they most definitely did not have back in 1980. No one is making those fridge-sized hard disk drives anymore. Of course, nowadays we have special storage devices with a gazillion regular hard disk drives crammed inside that have taken over the “ridiculously expensive” crown. As with any rare commodity, early hard drives were extremely expensive and were used with equally huge and expensive mainframe computers. The first hard disk drive, the IBM Model 350 Disk File we mentioned above, wasn’t something you got as a stand-alone unit. It wasn’t even something you bought. Instead you could lease the IBM 305 RAMAC computer that came with the 350 Disk File for $3,200 per month. Needless to say, back in ‘50s this was a lot more money than it is now. The first 5.25-inch 5 MB hard disk drives (i.e. the consumer option) in the ‘80s cost well over $3,000. Similar prices remained for the 10 MB drives that soon replaced them. This probably explains why most PCs were initially sold without a hard disk drive, instead relying on floppy disk drives. Factoid: A 5 MB hard disk drive from Apple cost $3,500 in 1981. That’s $700,000 per GB. And of course, 30 years ago most people couldn’t get their hands on 1 GB of storage even if they tried. Considering that we now have tiny, cheap USB sticks that can hold up to 64 GB of data, which is about 1,600 times more than a normal hard disk drive in 1990 (40 MB), and 12,800 times more than the first consumer hard disk drive in 1980, things have certainly moved forward. The IBM 350 Disk File from IBM via ed-thelen.org. 250 MB hard disk drive from 1979. 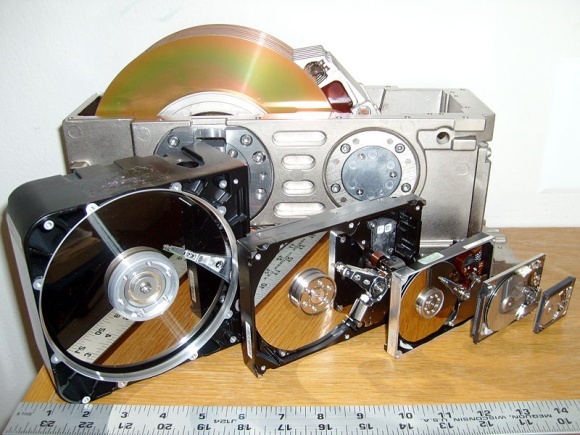 Hard disk drives of multiple sizes by Paul R. Potts. IBM 3380 disk drive module by ArnoldReinhold (Wikimedia Commons). Closeup of HDD head by Alexdi (Wikimedia Commons). Wikipedia was, as it so often is, a great help when checking out the facts and figures. Great Article, really puts things in perspective. It would be helpful if you could post some information on the evolution of disk speed I/O since the 1960’s ? As I understand it the disk speed have increased 4,5x but I cant find any sources that clarifies that…. looking fwd to my 1st Peta SSD. Thaanx for a great article………..